in order of my estimate of rarity. The 1994 Second Annual Passholders Event - Indy Preview, which was a special ticketed event, distributed decoders to those who stood in line two hours to question the builders. 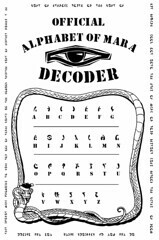 Several thousand 5&half;8&half;" xerox copies of a decoder on white plain paper with the code printed around the edge were handed out to mostly collectors. Rare, but not highly valued, and easily forged. The example available for download here is cleaner and sharper than the original which was distributed. The Castmembers Preview Event, which was open only to castmembers and their families, featured a folding white passport sized one with an eye printed on the cover and the decoder printed around the inside. Castmember's were allowed to ride once, their passports were checked as unstamped at the entrance and verified before boarding. Then the passport was stamped with a red 'visa' the shape of the eye on the cover after their journey. This lasted three nights, with multiple rerides granted on the last night. Some castmembers were seen to be hoarding unstamped passports. Several thousand were printed, most were canceled. Uncanceled castmember decoders are slightly more valuable than carefully stamped ones. Rare, with a wide range of value. The rarest are the genuine opening day guest pass decoders, equivalent of a backstage pass. They had an identity sticker and a braided neck cord attached and were made of heavy card-stock. There were several hundred made, very rare and highly valued. Forgeries: Be aware that many Los Angeles/Orange County area newspapers ran a full page insert with this design on it and distributed it in the advertising supplement (along with mfg. coupons) of the Sunday issue following the attraction's opening. The full sheet is worth more than one which has been cut out. The design was similar enough that forged passes were represented as genuine backstage passes. Printed on light card-stock. Several million were made, several million were thrown away with the newspaper. The "Green" decoder was distributed in the first month. A few boxes were misplaced and distributed to those who inquired a year later after all of the red ones had been distributed. Perhaps fifty thousand (50,000) were made. Moderately rare. The "Red" decoder was widely distributed during the first year. Perhaps a million (1,000,000) were made. Common. The Field Map was printed on the back with the largest decoder of all. It was available for purchase in the Indiana Jones Adventure Outpost. The Disneyland Paper Collection at finddisney.com has more historical Disneyland ephemera.